Iran is mulling over a plan to knock three zeros off the national currency rial as inflation soars above 26 percent in the country. Numerous proposals, such as 'lopping three or four zeros off the national currency' have been made to the government in a bid to overhaul the economy, said the Governor of the Central Bank (CBI) of Iran Tahmasb Mazaheri. "Such decision needs precise technical studies," the CBI chief added on Sunday after a cabinet session. 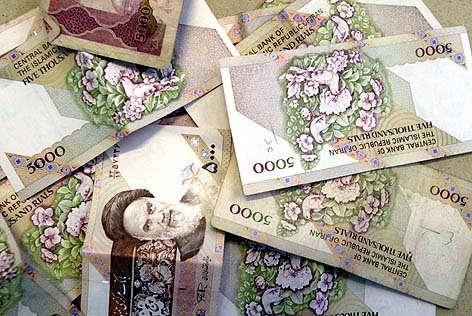 In September 2007, a member of the Iranian Parliament Gholam-Reza Mesbahi-Moqaddam said the president had ordered the Central Bank of Iran to study a plan to drop three zeros off the national currency. The double-digit inflation plaguing the country for years has eroded the value of the national currency whose highest-denominated banknote is 50,000 rials (about $5.3). "The issue of rial revaluation against other major currencies is also under assessment as well," Mazaheri added. The remarks by Mazaheri came a day after acting Economy Minister, Hossein Samsami, was quoted by the Donya-e Eqtesad business daily that Tehran is considering reducing the value of the US currency against Iranian rial in an effort to curb inflation. Several media reported in recent days that the country was evaluating an idea to raise the rial's value to 4,500 against the dollar from the current central bank rate of over 9,300 rials. "This rate (4,500 rials) comes from a study conducted years ago," said Mazaheri. "Under the current circumstance, a rial revaluation against the dollar requires extensive studies."